Royal Canin Labrador Retriever offers a wide range of benefits and is an excellent quality food for your dog. 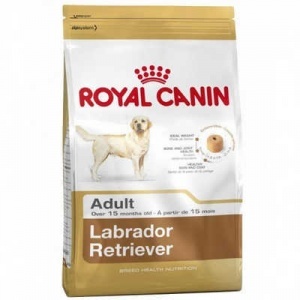 Helps maintain the Labrador's ideal weight with increased protein and lower fat plus L-carnitine. An exclusive kibble shape and formula help promote a feeling of fullness. Helps provide support for the Labrador's strong bone structure. Reveals the beauty of the Labrador's unique waterproof coat and helps maintain the barrier role of their skin. dehydrated poultry protein; rice; wheat; maize; maize gluten; animal fats; vegetable protein isolate*; hydrolysed animal proteins; vegetable fibres; beet pulp; yeasts; fish oil; minerals; soya oil; fructo-oligo-saccharides; psyllium husks and seeds; hydrolysed crustaceans (source of glucosamine); borage oil (0.1%); green tea extracts (source of polyphenols); marigold extract (source of lutein); hydrolysed cartilage (source of chondroitin). Protein: 30%; Fat content: 13%; Crude ash: 6.6%; Crude fibres: 3.8%; EPA and DHA fatty acids: 4 g/kg.